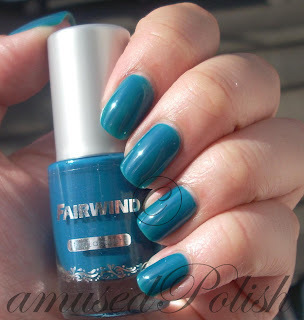 I stumbled upon this polish while I was in the neighbourhood of a "Schlecker" drugstore. 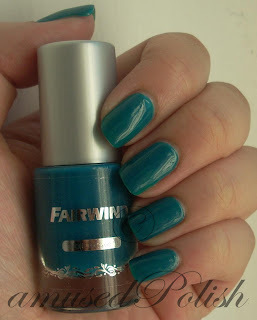 Fairwind is a drugstore brand but doesn't have a permanent display and they only put out some Limited Edition Displays out (I heard they also sell them sometimes at the DM drugstore in Germany). And I don't often go to the shop (Schlecker) because it doesn't have the best "atmosphere" there and the ones that are nearest to me, are areas that I don't visit often (anymore- my old highschool, etc.). Anyway, back to the polish. It's a gorgeous middle-toned teal jelly, leaning more towards blue than green. That was the last bottle in the store and I kinda wish there was another bottle because I would've bought a backup of it in a heartbeat. Another thing that is a huge plus, it was only 99 cents! Teal covered nicely in three coats and it had a superb formula too. 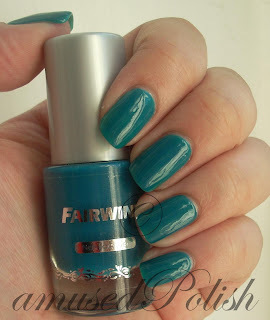 I was in love with this polish and it started my love with jellies too :o.
Ich hab den Lack entdeckt, als ich beim letzten Mal beim Schlecker war. Ich geh wirklich selten zum Schlecker, weil ich keinen in der Nähe hab und dafür extra wo hinzufahren, ist mir zu mühsam, vor allem, weil die auch nicht viel aufregendes haben und die Atmosphäre dort nicht sehr zum einkaufen einlädt. Teal war mit drei Schichten deckend und hatte eine schöne Konsistenz zum pinseln. Ich liebe die Farbe wirklich sehr und es ist auch der Lack, der meine Liebe zu Jelly-Lacken entfachte.